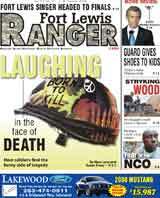 Army Times announced that Fort Lewis's 1st Sgt. William Harlan is the paper's Soldier of the Year Click here for the report. The road that will connect Spanaway with I-5 via Fort Lewis started construction this week. Click here for the WSDOT report. Stryker equipment back from Iraq lands this week in Olympia. Expect plenty of protests. Click here for the Olympian's report. Capt. Tomoaki Iishiba from Fort Lewis admitted in a plea agreement that he illegaly exported firearms parts from the United States to Japanese. Click here for the PI's report. CAMP TAJI - Every Sunday morning at 9:15 a.m., without fail, you can hear a gospel song emanating down the hall of the 1st Sustainment Brigade headquarters building. For those faithful Sunday school members making their way down the hall into the conference room, it’s not the music that draws them, but the spiritual lesson they are about to receive. As McCurry continued to grow as a Christian, he looked for opportunities to serve the Lord, and the Lord gave him a burden to serve in a full-time capacity. “In spite of His calling, He has allowed me the privilege to continue to serve in the U.S. Army while I simultaneously serve in the Lord’s Army,” McCurry stated. McCurry is very active in his local church in Manhattan, Kan., and as a result, did not want to take a 15-month break in his service for God. Even after joining the 1st SB, McCurry knew the Lord placed him there for a reason. “I continued praying about how I could serve the Lord while deployed,” recalled McCurry. “Before our deployment in September 2007, my wife, Ruth, and I talked about the possibility of me starting a Bible study (or) Sunday school class in Iraq. After we deployed, I shared my burden with our brigade chaplain. He supported the idea of a Sunday school class that we could schedule to precede our traditional Protestant service each Sunday morning,” shared McCurry. However, before he committed fully, he felt that he needed his boss to approve. McCurry has two primary goals for the class. “First, and most importantly, I want every student to have trusted the Lord Jesus Christ as their personal Savior, thus ensuring their eternal destination is heaven. Secondly, for those students that are already Christians, I desire for them to have a closer, daily walk with the Lord. This walk should include reading, studying, and memorizing Bible scriptures, a consistent prayer life, and a burden to share their testimony of Christ with others,” states McCurry. The material used in the class is written by several pastors in the states who prepare and publish Bible study curriculums for classes like this. Each of the curriculums has 13 lessons, which makes 13 weeks of material. “So far, we have studied about having a victorious Christian life and about the life of Joseph (from Genesis); we are currently learning about the truths that every Christian needs to know. “I have learned a lot about new ways to get closer to God, the Holy Spirit and how it dwells within us,” said 1st Lt. Cory Burnett, a, Plymouth, N.C., native, and postal officer for the 2nd Platoon, 22nd Human Resources Company out of Ft. Lewis, Wash.
For Spc. Bryan Fadely, a Raymondville, Texas, native, and gunner on the brigade’s personal security detail, the class is something he looks forward to and is proud to be a part of. “This has truly helped ease the burden of the deployment (and) helped show me that this is just where God wants me right now,” stated Fadely. Each class runs about one hour and the class’ average attendance is about 11 students. The highest attendance has been 17 on one Sunday, which was exciting. With occasional work commitments, emergency leave situations, and R&R, the attendance fluctuates a little. The class has been blessed with a good core group that tries to be as faithful as possible. Since all of the material costs money, McCurry and Maj. Terrence Hayes, a Grants Pass, Ore., native, and the brigade chaplain, prayed about how they could fund the Sunday school class. About the same time as they were praying for finances, McCurry communicated with his Pastor in Kansas, Stephen Henderson, about the idea for the Sunday school class. “Pastor Henderson graciously offered for our local church, Harvest Baptist Church, to buy the needed curriculums. In addition to the support we have received from my church, several missionaries that have ministries to the military offered to help. Mr. Bob Ingram, from the Christian Service Center at Fort Benning, and Col. Tyler Ryberg, from Worldwide Military Baptist Missions, both sent us other material, to include free Bibles, for the class,” recalled McCurry. As the weeks go by and the end of the deployment draws near, Soldiers will be reunited with their families soon. With that in mind, McCurry has decided his final series will be a study about having a household built on faith. “I think this will be very helpful for all of us as we reunite with our Families after this period of separation,” concluded McCurry.